YAIZA TERRÉ · NOVES TARGETES DE L’ESTUDI A L’AUTOMÀTICA! NOVES TARGETES DE L’ESTUDI A L’AUTOMÀTICA! 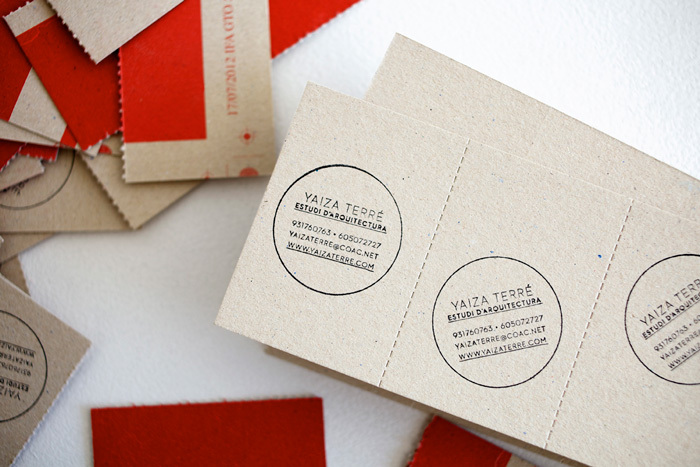 New studio cards at l’Automàtica! FENT UNA VISITA A L’AUTOMÀTICA VAM TROBAR UNS CARTRONS AMB UNA IMPRESSIÓ DEFECTUOSA PER UNA CARA. EN FERRAN VA TROQUEL·LAR ELS CARTRONS AMB UNA DE LES SEVES MÀQUINES PER PODER-LES DIVIDIR EN TARGETES I VAM ESTAMPAR EL SEGELL DE L’ESTUDI PER LA CARA DEL DARRERE. On a visit to l’Automàtica we found some cardboard with defective print on one side. Ferran die cut them with one of his machines in order to be able to divide them into business cards and we put the stamp of the studio on the back.